I popped over to The Teaching Trio to connect once again with some great bloggers! I have missed posting each week! This week...is our first traveling volleyball tournament in Milwaukee. It is a 3 and 1/2 hour trip for us, but I will have two of my girls with me. We are going to make it a memory packed weekend...that is my hope! One of my words is ADVENTURE...I will see what that adventure might be! We will be CONNECTING with family for starters! I am still setting up for this week's lessons. They are a bit more adventurous as well. We are celebrating with a Penguin Party using my STEM Winter Antics Pack with my 2nd graders to wrap up our solids part of our FOSS solids and liquids unit! 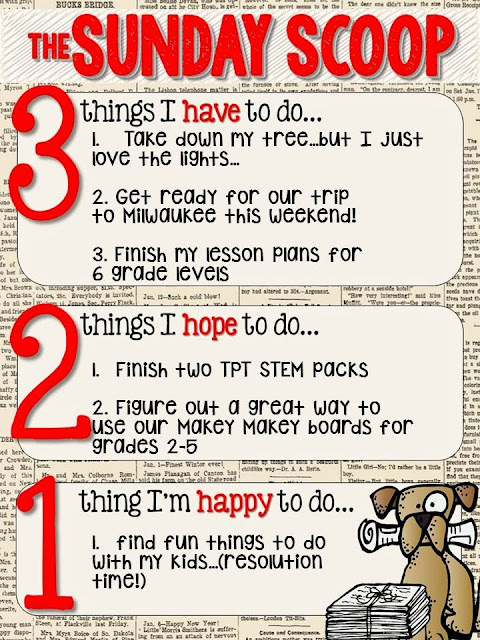 I am also planning with my amazing...wonderful librarian, lessons to go with our Makey Makey boards that I just purchased for science/art/music/library so that we can COLLABORATE ...yes another goal...hope to do that with other teachers in other schools, too! Also hoping to finish my holiday STEM St. Patrick's Day Pack and STEM Easter Pack, but really love my STEM Robot Pack...so I am aiming for 2 more done this week. GOALS are another one of those magic words and my goals are big this 2016! So with all that being said...FUN is a big goal in my mind! I think sometimes we are on a hamster wheel ...always doing the same thing. I only have so much time with my children...I must make some fun happen. So...today? Not sure, but I will think of something! I can relate to the "hamster wheel" analogy. It is so easy to get stuck in a rut. I'm looking forward to seeing those seasonal STEM products! Thanks so much Jan for stopping by! I can't wait until Valentine's Day...that STEM pack will come in handy! Always something to work on to help our own rooms and others! I just made a game for our family to use during the Packer game so that we all watch it together. Something FUN when it's cold. You are so right, we only have so much time...it's always good to step off the hamster wheel for a little bit! Thanks so much for stopping by! It is always nice to see a new face! Have a great week!